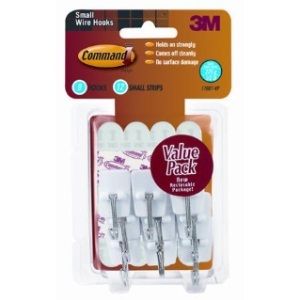 The Command Small Wire Hooks are small white wire hooks that uses a revolutionary adhesive that verifies you damage-free hanging. The Command Small Wire Hooks require no nails, screws or tacks and can support up to 1/2 pound. These wire hooks are easy to apply to variety of surfaces such as tile, wood, paint and more. 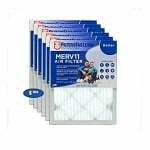 Removing is a breeze, leaving no marks, holes, stains or sticky residue. Simply pull on the adhesive tab and it releases its hold. Applying a Command Refill Strip allows you to reuse the wire hooks numerous times.